Olympian Ibtihaj Muhammad speaks to The Nation about why being a representative figure is more often a blessing than a burden. Not only is Ibtihaj Muhammad the only Muslim-American woman to ever medal at the Olympics and the first American woman to ever compete while wearing a hijab, she has also been utterly fearless about taking on political issues. From her open letters to Donald Trump in Time magazine, to her outspokenness after being detained at the airport, Muhammad has refused to just “shut up and play.” Here I interview her about being a political athlete. Listen the entire interview on the Edge of Sports podcast. Dave Zirin: At what point were you aware that just by being on the Olympic team, you would be making history? Ibtihaj Muhammad: It wasn’t something I really consciously thought about, I would say until after I qualified for the team in 2016. Then it became a media storm around my name and qualifying as the first Muslim woman to do so. I know that I’ve always been aware of being different and breaking into spaces where I felt underrepresented, whether that be as a person of color or a religious minority, especially in the sport of fencing. To be able to overcome obstacles not just in sport but outside the sport to become the first Muslim woman on Team USA, and then to come home with a medal, it was a phenomenal experience, and my journey has felt so much bigger than me because I see that more people are going to come after me. Not just the Muslim kids but the kids who may not have access to ice hockey, or fencing, or gymnastics and saying, “Well, I don’t see people that look like me.” And I think that is what was so groundbreaking about this Olympics specifically for Team USA, specifically for women and minority women, because we had so many firsts. To have Simone Manuel be so amazing in the pool, to see Simone Biles be so amazing on the gymnastics floor, and to have a Muslim woman compete in the sport of fencing, to me it felt very moving, not just for me in fencing, but to see people break and shatter those ceilings all around me. DZ: How much of being this trailblazer and “representative figure” is blessing and how much is burden? IM: It’s never felt like a burden, and I’ll tell you why: I’m comfortable with my skin color, I’m comfortable with my religious beliefs, I’m comfortable with being Ibtihaj, and I’ve always been like that. But I’ve seen how being different can affect how other people treat you, how they view you, and I feel like that’s a projection of their own insecurities. DZ: Can you speak about the support of the Muslim community? IM: Every single Muslim, and there are millions around the world, every single one of them I consider a brother or a sister, right? And that sense of support from the community, I can feel with just the push of a button. What’s particular for me as an athlete on social media, I get messages from all different corners of the world, Muslims and non-Muslims, but just to have someone say something like “I prayed for you this morning,” right before I go out for my first Olympic games, right before I step on the strip in Rio, that even subconsciously helps me. As a spiritual person, I believe in the power of prayer and I believe in using prayer not just to help you physically but to help you mentally. You know, if I believe that everything that happens to me is meant to happen in the way that it does, I’m never going to get caught up in a loss. I remember after I had lost in the second round of the Olympic games, people were relentless on social media, I mean my trolls were out so strong and they were so mean, but they’re just words. For me, that’s the way that it was meant to happen. Little did I know that four days later, I would win a medal with my team, but that’s the amazing part about believing in what God has written for you. DZ: You’re no doubt aware that there are many conversations on social media about African-American Muslims feeling invisible in the Muslim community. IM: So my parents are African-American, they converted to Islam in the ’70s. When people think of Muslim community, for whatever reason, specifically here in the United States, there is an othering that happens. We think of Muslims as being Arab, we think of them as being foreign and not American, but what people don’t realize about the Muslim community is that the African-American community is the largest population of Muslims here in the United States. So it’s interesting that when you’re black and Muslim, there’s a weird dynamic that kind of happens where you’re almost not black enough for the black community, and you’re not Muslim enough for the Muslim community, so there’s a tug and pull that takes place on a day to day basis, where you almost feel like you don’t belong. DZ: You mentioned your father a moment ago, a retired Newark police officer, you’ve been outspoken on the question of police violence and Black Lives Matter, what pushed you in that direction to say this is something I need to talk about? The reality is something affects a neighbor, if something affects someone that I don’t know, I have a responsibility as a global citizen to speak out on those issues. DZ: I also read that you were detained by customs at an airport, can you talk about what happened there? IM: We had an emergency landing in Charlotte, North Carolina, and a TSA agent flagged us for whatever reason, he didn’t say anything to us, he flagged our customs forms and without any explanation we were pulled into secondary screening. We sat in secondary screening for hours, we weren’t given any explanations, and we missed our connections. We missed our flight and it stinks for a multitude of reasons. To feel like you’re being targeted for your religious beliefs or your skin color, it is, even though you know what it feels like, it stings every single time. For me to be in that room with people who were having visa issues and may not have had proper documentation to visit the United States, people being told to contact their attorneys, I’m pretty sure we were the only Americans in the room, it just felt like I was being singled out and I didn’t belong. My response in that moment was to cry, and I’m like ‘Ok, that’s not helping,’ and it was just a very hurtful moment and a very real moment, I’ve never had that happen to me, and again, I travel for a living. I travel to 12 to 15 countries a year and that’s just for sport, you know what I mean. So to have this happen to me not just an an American citizen but also as an Olympic athlete that represented our country at the games just a few months prior, it just felt very real and hurtful for me and my sister. DZ: The head of Homeland Security, John Kelly, recently gave a speech where he said no one is ever stopped at the airport due to their appearance or religion but always because they said or did something. What message do you have for him? IM: I’m pretty sure that he knows those are alternative facts. He knows that. That’s obviously not true. I can’t even take that comment seriously. [Laughter] As someone who is profiled every single time I go to the airport, I’m pulled over and patted down because I wear a headscarf every single time I go to the airport, that alone is profiling. So to say that I would have to say something in order to be targeted, that’s not true. DZ: Now speaking of this Department of Homeland Security and this administration, you wrote this really incredible letter, open letter, to Donald Trump months back where you talk about this administration “whipping up a climate of fear and hatred,” and I wanted to ask what your thoughts right now about this administration. IM: I don’t know if I feel differently now than I did 100 days ago. I think you are hoping for the best, but you are preparing for the worst. There hasn’t been a lot of change or at least change for the better that I have been able to see, so until things improve for refugees, for women, for the transgender community, then I don’t know if we are moving in the right direction. DZ: On a much happier note, you were named to the Time 100, What was that like? IM: It’s an honor to be named to that list, and for me I guess it helps me refocus your goals, and you realize “actually I’m not doing enough there’s more I could be doing.” I mean there are people that, especially in the field of science, who are really doing these remarkable things for us as a global community. It was an honor to be named to that list and I hope to continue, not just as an athlete but as a sports ambassador to change the world for the better, and also change the narrative and the perception people have about the Muslim community, the African-American community. 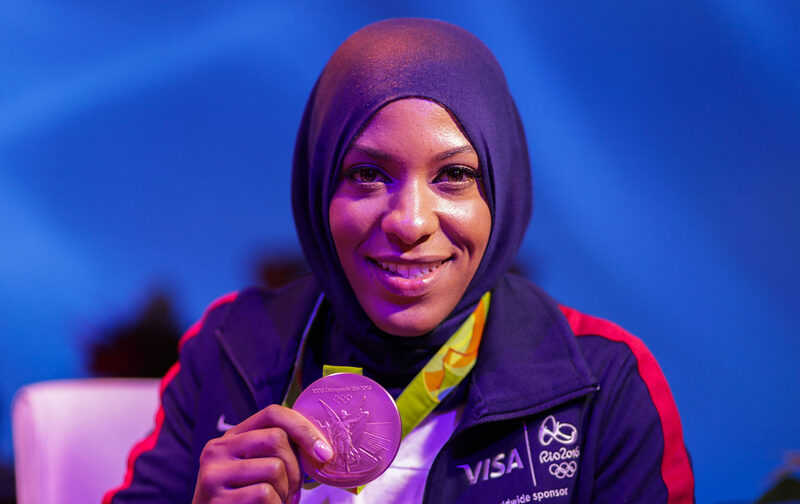 Listen to the full interview with Ibtihaj Muhammad on the Edge of Sports podcast.